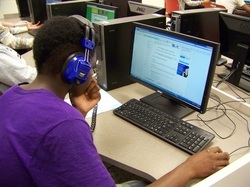 Students work on college applications during senior seminars. Seniors will have an opportunity to work on college applications during CFNC's College Application Week, November 18 - 22. All seniors will be scheduled to come to a computer lab during English class to work on college applications. Many colleges will be waiving application fees during this week. For a list of colleges waiving fees, please see the link below.